This book is the second in my series about synesthesia, a condition in which words are seen to have their own colours, or music or tastes have associated colours or sounds. Isherat or reading water is a complex skill in which the weather and water can be understood and predicted by looking for signs. A kind of meditative looking, while having experience and knowledge of, for example, the sea. It predates any technical equipment used in navigation and has more to do with the seeing and understanding developed by people who are surrounded by water or seas. Hence "Isherat" which is a word used by native sailors in the Pacific Ocean. 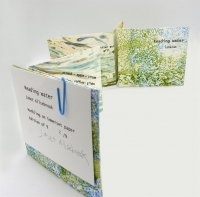 The concertina book, made by marbling oil on water, uses words to suggest the sounds of water effected by wind, current, gradient, direction and flow. The series began with "Listening to Snow," which also related to the confusion of the brain after a stroke, when the wrong word is found while searching for the correct one, a condition known as Aphasia. 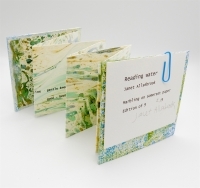 Book size closed 10 x 9cms. open 78 x 10cms. Oil paint on somerset paper with card covers and additional transfer print.